The Minnesota Twins have recorded 25 saves this season. 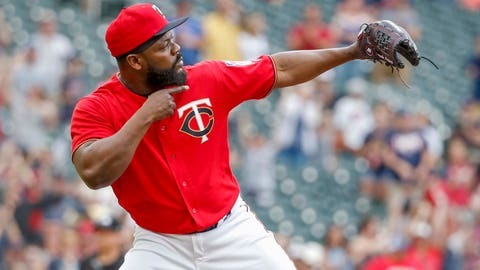 All 25 were accumulated by Fernando Rodney, who was dealt to the Oakland A’s on Thursday night. With Rodney gone, who will manager Paul Molitor use in the ninth inning to lock down a victory? While a bullpen by committee is possible, managers generally find one reliever to be the go-to guy. Let’s take a look at some short- and long-term possibilities for the Twins. Trevor Hildenberger: A closer in the minors — in 2016 he had 19 saves and a 0.75 ERA — Hildenberger has only one major-league save, which came last year. He has struggled some in 2018 with a 4.50 ERA and 1.4 HR/9 innings, but he’s a control pitcher with experience in late-inning situations. On the downside, after a strong first half he has gotten bombed since the All-Star break, allowing 11 runs in 10 innings with an opponent slash line of .386/.404/.773. Gabriel Moya: The left-hander, acquired from Arizona last season, had 24 saves in his time in Double-A in 2017, including seven in 13 appearances for Chattanooga. The pedigree is there, but is the 23-year-old ready? He sports an inflated 4.96 ERA this season, but has a 1.163 WHIP and 8.8 K/9. His 1.7 HR/9 is worrisome and he’s had limited high-leverage opportunities. Matt Magill: Magill has six career saves — all in the minors leagues, two of which occurred this year in his brief stint in Triple-A. Magill has one of the better WHIPs out of the bullpen this season (1.195) and is striking out 8.6 per nine innings. In high-leverage situations opponents are just 2 for 17 (.118) with no extra-base hits. However, he’s only fanned three batters in those situations and also has been prone to the longball this year (1.5 HR/9). Addison Reed: Seems like the most logical choice as the veteran right-hander has 125 career saves, including 19 last season with the New York Mets (before he was dealt to Boston). Plus, he’s signed through next season, so that could kill two birds with one stone. On the downside, Reed hasn’t exactly flourished in his first year in Minnesota. He has a 4.74 ERA in 44 appearances and opponents have a slash line of .299/.355/.497. However, in high-leverage situations that dips down to .268/.308/.380. Taylor Rogers: Perhaps the least-likely choice, since he has no saves at any professional level. But Rogers is arguably having the best season of any Minnesota reliever. Despite a 3.80 ERA, he has a 1.141 WHIP, is striking out a career-high 10.5 batters per 9 innings and his home run rate is decent (0.6/9). The left-hander has yet to allow an extra-base hit to a lefty this season (righties are batting .271/.336/.479), so maybe he gets a few opportunities depending on the situation. Alan Busenitz: The 27-year-old did not fare well with the Twins this year in his 11 appearances (6.23 ERA, .339 OBA) but last year with Minnesota he had a 1.99 ERA and .206 OBA in 28 games. Busenitz has six saves with Triple-A Rochester plus a 2.61 ERA, .223 OBA and 9.9 K/9. John Curtiss: A fourth-round pick in 2014, Curtiss has fallen off the prospect radar somewhat and did not fare well in his brief stint with the Twins this year and last (a combined 11 runs allowed in 9 1/3 innings). But he had a combined 19 saves last season in Double-A and Triple-A, when he also posted a 1.28 ER and .135 OBA, and leads all Twins minor leaguers with eight saves in 2018 (yes, eight). With Rochester this year he has a 3.14 ERA, .197 WHIP and 10.7 K/9. Curtiss is 25 year old. Jovani Moran: The 21-year-old seventh-round pick in 2015 is still a ways away, but he’s been impressive in his pro career thus far. This year at Cedar Rapids, Moran had a 2.03 ERA, 1.69 OBA, 1.17 WHIP and 14.2 K/9 before being moved up to Fort Myers, where in 15 2/3 innings he’s allowed three runs (two earned) on nine hits with just one walk and 20 strikeouts. Cody Stashak: Drafted in the 13th round in 2015, Stashak has slowly moved up the organizational chain and is now in Double-A, where he has a 2.93 ERA, 1.15 WHIP and 12.1 K/9 over 46 innings. He’s converted all three of his save chances as well. Already 24 and just making it to Chattanooga this year, he’d qualify for the longshot category. Cody Allen: What could be sweeter than signing a division rival’s closer? Allen has had 20+ saves in each of the last five seasons, including 2018, for Cleveland. However, he’s had perhaps the worst year of his career with a 4.37 ERA, 1.246 WHIP, 1.7 HR/9 and a career-low 10.1 K/9. He turns 30 in November. Brad Brach: Brach was excellent in Baltimore as a setup man and fill-in closer (he had 18 saves in 2017 and 11 this year) but he struggled some with the O’s in 2018 (4.85 ERA, 1.721 WHIP). He was traded to Atlanta and perhaps he just needed a change of scenery away from a bad Baltimore team, as he’s tossed four scoreless innings with the Braves with five strikeouts. He could be looking for an opportunity to close in 2019. He’ll turn 33 in April. Zach Britton: After having one of the best seasons for a reliever in MLB history in 2016 — not to mention very strong years in 2014 and ’15 — Britton has been curtailed the last couple of years due to injuries, his control especially having been affected. Still, he has probably the game’s best sinker and — as evidenced by his suitors at the trade deadline (eventually being traded from Baltimore to the Yankees) — should be in high demand this offseason. The somewhat-rare left-handed closer, he turns 31 in December. Tyler Clippard: Clippars hasn’t been a full-time closer since 2015, but he had 32 saves in 2012 and has saved a game every year since, including seven with Toronto this season. Clippard is a little on the wild side (3.7 BB/9 over his career) but he also has a good WHIP (1.126) and can strike guys out (10.0/9). He turns 34 in February and could be a cheaper option for some team (if he wants to close again, that is). He’s making just $1.5 million with the Blue Jays in 2018. Jeurys Familia: After saving 43 games in 2015 and 51 in ’16, Familia struggled in 2017 in part due to a shoulder injury but regained his closer role this season. He tallied 17 for the Mets this year before being dealt to Oakland, where he is no longer closing games. He’s adjusted well so far to his new role and the transition to the American League, allowing just one unearned run on five hits over 10 innings with 12 strikeouts for the A’s. Overall this year he has a 2.31 ERA, 1.125 WHIP, 0.2 HR/9 and 9.8 K/9. He does come with some baggage, though, having been suspended 15 games for a domestic abuse charge (the charge was eventually dropped). Kelvin Herrera: You might be sensing a trend here … Herrera was Kansas City‘s closer the past few years before being traded to Washington before the July 31 deadline this season. An All-Star in both 2015 and ’16, Herrera certainly knows the AL Central. He struggled somewhat in 2017 (4.25 ERA, 1.348 WHIP) but had a 1.05 ERA and 0.818 WHIP for the Royals before being dealt. He has not fared well so far with the Nationals, though, posting a 4.76 ERA, 1.824 WHIP and 2.1 HR/9 in 19 games. He turns 29 in December. Craig Kimbrel: Would Boston really let him walk? Either way, as one of MLB’s premier closers (324 saves, 1.86 ERA, 0.920 WHIP and 14.6 K/9 over his nine-year career), some team will open up the bank vault for the 30-year-old. Andrew Miller: Despite being one of the best relievers in baseball, Miller has only really been a closer once — in 2015 with the Yankees, when he had 36 saves. From 2012-17, Miller had a 2.01 ERA, 0.892 WHIP and 14.1 K/9. He’s been sidelined a lot in 2018 due to injuries and has pitched in only 21 games for Cleveland, recording a 3.44 ERA, 1.418 WHIP and 12.8 K/9 in 18 1/3 innings. The left-handed Miller is 33 (34 in May) and it will be interesting to see how his injury-filled 2018 affects his 2019 contract. We’re guessing he’ll still get a good haul.